Florida’s world famous for its beaches, theme parks, and summer weather, but not to be forgotten is its unparalleled fishing. From big game deep sea fishing to casting off a pier, from reeling in a monster bass to catching some panfish for the dinner table, there’s a huge variety of fish and ways to catch them for anglers of any skill level – and the same goes for any type of family. If you’re thinking of vacationing in Florida and want to take advantage of its wonderful fishing opportunities, then check out below for 10 of the best family fishing destinations in the state. 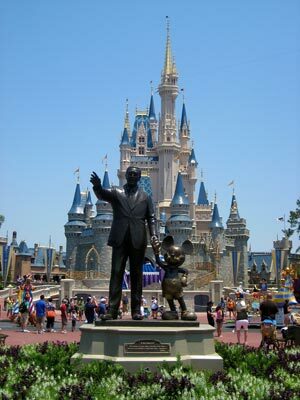 The Partners Statue and Cinderella Castle. Among the most ultimate destinations for family getaways, Disney World is a kid’s dream come true – and also for anglers as it’s quite the bass fishing paradise, if you can believe it. Fishing charters and guides are available for both Bay Lake and Seven Seas Lagoon. Don’t let the surroundings fool you, trophy largemouth bass are all over Bay Lake. Can there be a more magical lake to fish then having Cinderella Castle in the background as you reel in a 10-pounder? The best time to go is in February, when bass are biting the hardest. Check out this blog by a WFN Ambassador detailing his fishing trip last year to Magic Kingdom. Boasting the largest fishing fleet in the entire state, Destin is a great town if you’re looking to take a charter boat for some offshore fishing with the family. In addition to being home to miles of some of the finest beaches in the country, Destin has great shopping and entertainment on shore when the kids need a break from reeling in the big one. With its beautiful beaches, emerald-green water, great history of fishing, and small-town feel, it’s no wonder Destin’s nickname is “the luckiest fishing village in the world” – and why it was Florida’s top vote-getter for WFN’s Ultimate Fishing Town contest. One of many great fishing spots in the Florida Keys, the Long Key State Park is for any family that enjoys camping. Full-facility campsites overlook the Atlantic Ocean, but be sure to book well in advance as there’s only 60 campsites – even as far back as 11 months prior to the vacation. Some of the best bonefishing in all the Keys is right here at this park, and it’s also a great place for fly and kayak fishing. If you have access to a vehicle, the kids would get a kick out of handfeeding tarpon at Robbie’s Marina (see video above), located just a few miles east of the park. 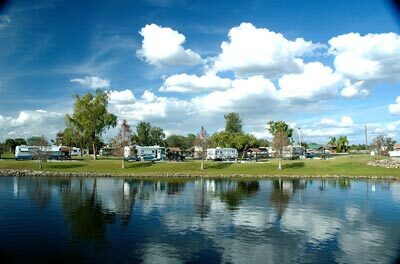 A campground on the shores of Lake Okeechobee. The premier bass fishing lake in all of Florida is Lake Okeechobee, an often used site for some of the biggest tournament series in North America, like the FLW Tour and Bassmaster Elite Series. If catching huge largemouth bass is what you’re after, this is the place to go. There are resorts sprinkled out all around the lake, many providing guides and charters to help you find the right spot. Or you can rent a boat yourself if you feel comfortable enough. If staying at a resort or nearby hotel is out of your price range, there are also nearby campgrounds and RV parks you can stay at. fighting fishWant to catch a record fish of your own? Well now you can! Catching a trophy fish is a great reason to be proud, but a world record fish is even better. Here’s everything you need to know to catch a world record fish and earn a fishing legacy you can really be proud of. Accessibility is what makes fishing so great in the town of Sarasota, which is located on the southwest coast facing the Gulf Of Mexico. Though it’s primarily known for its love for the arts, fishing is wholly embraced by the community, as there are lots of public access points to the Ocean and enough guides and charters to appease anyone. Some hotels even have guides for hire. Popular species to target include snook, redfish, trout, grouper, and dorado. When not fishing, you can check out the arts scene, hit up Siesta Key (one of the best beaches in the U.S.), summer festivals, aquariums, and so much more. Despite being just 55 miles northwest of Orlando, Lake Panasoffkee feels like you’re away from it all. Surrounded by parks and campgrounds, this lake is known for its bass fishing and big longnose gar. Lake Panasoffkee Park offers a whole line of fun outdoor activities in addition to fishing and camping, including biking, horseback riding, hiking, bird watching, and more. The lake itself is surrounded by a healthy dose of affordable lodges and resorts if you prefer to go that route. 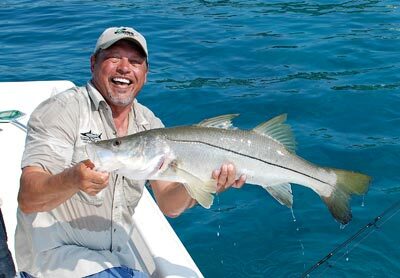 Henry Waszczuk with a snook, one of many species of fish available for anglers in Key West. One of the best places to fish in Florida is Key West, and one of the most popular places to take a vacation in general. This tourist-friendly location features both flats and offshore fishing, from bonefish, sharks and tarpon to tuna, sailfish, and marlin, guaranteed there’s something out there to catch no matter what time of year you go. There’s a plethora of guides and ship captains for hire that can take you out for whatever species you want to target. There are festivals, museums, music, and so much more to check out when not on the water. 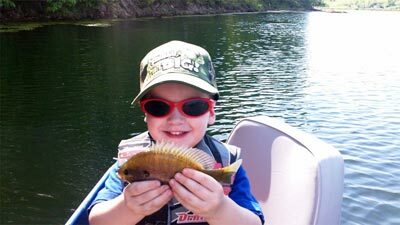 A young angler is delighted to hold up a bluegill. This park is located on the shores of not only Lake Kissimmee, but also Rosalie and Tiger. All three offer a variety of fish, including largemouth bass, bluegill, catfish, crappie, and chain pickerel. There’s a boat ramp for Kissimmee, but you can catch any of these fish from the shore as well, best spots being canal banks, the marina, and dam. It’s also a great park for camping, either full facility or primitive, if your family’s up for backpacking in. The Kissimmee chain of lakes is a haven for canoe/kayakers. Alongside Destin, it was one of two finalists from Florida in WFN’s Ultimate Fishing Town contest. A view of St. Augustine from atop Anastasia Island. Located in northeast Florida, St. Augustine has plenty of charters for hire for offshore or inshore fishing, and fish camp resorts that’ll provide all the help you’ll need to enjoy a fish-filled vacation. If staying in a resort or hotel isn’t your idea of a family fishing trip, Anastasia State Park, situated alongside the Atlantic Ocean and a short drive from St. Augustine, contains 139 full-facility campsites. Founded way back in 1565, St. Augustine is considered to be the oldest town in continental United States. Founded way back in 1565, St. Augustine is considered to be the oldest town in continental United States, so be sure to check out the history when your family’s not out catching fish. Own a yacht? Then a trip down to Fort Lauderdale is the place for you. This town fully embraces boat owners, containing hundreds of marinas and boatyards and a canal system so intricate that Fort Lauderdale is nicknamed “the Venice of America.” Some of the top species in southeast Florida include sailfish, sharks, wahoo, snappers, groupers, swordfish (as seen in the video above) and so much more. When not out fishing, you can check out Fort Lauderdale’s beaches, museums, and its nightlife, one of the most vibrant in the state. Be sure to go to our Florida Fishing section for more on fishing in this great state, including videos, tips, and more!